The Education Committee heard testimony Feb. 27 on a bill that would increase state financial aid to students who attend accredited independent colleges and universities in Nebraska. LB490, introduced by Sen. Lynne Walz of Fremont, would create a need-based grant program for eligible students who attend privately controlled, nonprofit postsecondary institutions in the state. Nebraska residents enrolled as full-time or part-time undergraduates at eligible institutions could receive the grants. Walz said the bill would help more Nebraska students attend the school of their choice. Total need-based aid to Nebraska’s private, nonprofit colleges and universities is approximately $3.1 million, compared to $16 million for public postsecondary schools and $1.8 million for private, for-profit schools, she said. At the same time, Walz said, the state’s private, nonprofit schools enroll more than 33,000 students and in 2013 awarded more than 40 percent of bachelor’s and advanced degrees in the state, including 54 percent of all business degrees, 57 percent of all health science degrees and more than one-third of all teacher education degrees. Those institutions also awarded 200 more degrees to African-American students than the University of Nebraska and other state colleges combined, she said. “Despite their smaller size and more limited funds, independent colleges serve as an essential option for minority students,” Walz said. William Motzer, vice president for enrollment management at Nebraska Wesleyan University, testified in support of the bill on behalf of the Nebraska Independent Institutions of Higher Education. Over the next five years, he said, the number of white, non-Hispanic Nebraska high school graduates will decrease by 9 percent and the number of Hispanic graduates, whose families generally earn less, will double. Those changing demographics will result in college enrollments that are more diverse and in greater need of financial aid, Motzer said. “Supporting LB490 will ensure that the growing number of low-income students will have financial access to the institution of their choice,” he said. Brian Friedrich, president of Concordia University, also spoke in support of the bill on behalf of the Nebraska Independent Institutions of Higher Education. Nebraska’s support for resident students attending independent colleges and universities is less than every other Big 10 state, he said. In 2016, Friedrich added, Iowa awarded $49.1 million to students attending independent colleges and universities, 15 times more than Nebraska. 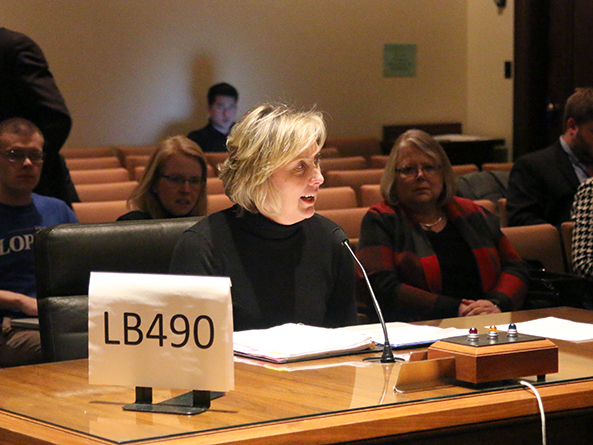 Angie Cook, a junior at Nebraska Wesleyan University, also testified in support of LB490. She said her family could not have afforded tuition there if she had not received one of the school’s two full-tuition scholarships it offers to incoming freshmen. 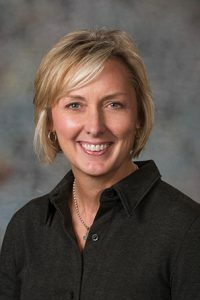 Testifying in opposition to the bill was Susan Fritz, executive vice president and provost and dean of the graduate college at the University of Nebraska. She said the bill would create a separate state financial aid program for students who attend private colleges at a time when the state is considering millions of dollars of cuts to public higher education. Fritz said the Legislature instead should allot more funds for the Nebraska Opportunity Grant (NOG) program, which provides need-based aid to students who attend public or private institutions. In the 2014-15 school year, she said, 11,478 University of Nebraska students were eligible for a NOG grant, but only 3,865 received one due to a lack of funds. Mike Baumgartner, executive director of the Coordinating Commission for Postsecondary Education, provided neutral testimony on the bill. He said the NOG program, which the commission administers, awarded $16.8 million in aid to both public and private school students for the 2015-16 school year, but only about a third of those eligible received a grant before funding ran out.